When the weather is as hot as it’s been this summer, there’s no other place our family likes to spend time than at the pool! Especially with Sophie learning how to swim, we want to make sure she gets as much practice as she can while the weather is warm. Each week, I make sure to have our pool bags packed with all the essentials for an afternoon of swimming. Beach towels, snacks, toys, floaties, and sunscreen galore are always in the bag. This summer, I’m so excited I get to pack something fun for me, my Ledge Lounger Swan Float! This pool float is unlike any other float you’ve seen, it’s truly beautiful! The swan has a pearlized white body and gold ombré tips, which truly sets it apart from the others in the pool. I can lay out comfortably and work on my tan or cruise around the pool with Sophie as the captain. She loves this giant float! This is a great pool float for the entire family to enjoy. Hosting a pool party this summer? The Swan Float is a must! Think of this beautiful swan as the perfect centerpiece for your outdoor festivities. 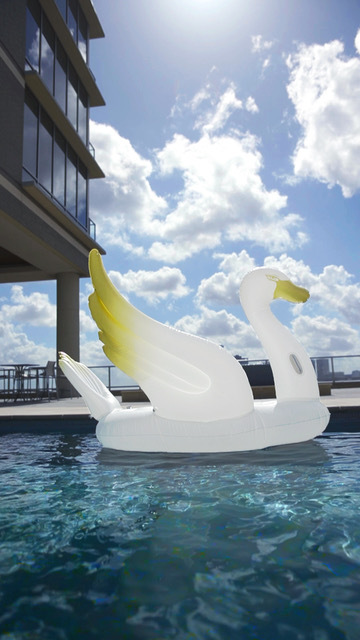 Not to mention, this unique float is that go to accessory for your poolside Instagram shot, #swanfloat! The Swan Float is available for a limited time only, so be sure to order yours before they fly away!